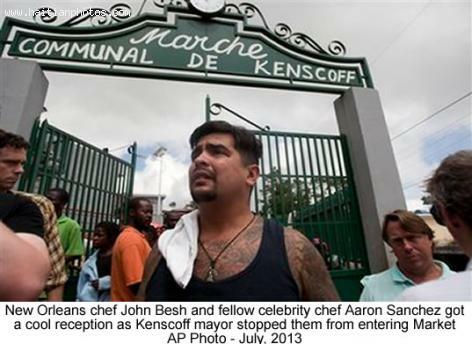 However, upon arriving in Kenscoff, a mountain town outside of Port-au-Prince, their smooth reception was blocked by the town's mayor, Widjmy Clesca, who blocked the two chefs and their accompanying journalists from entering the market and taking photos that would prove unflattering for the town. The two chefs were unsurprisingly flummoxed by the reaction, with Sanchez commenting that it was all a little intense. They were even subsequently blocked by the same mayor when they tried moving on to a community organization working with local farmers as their visit had not been approved. The two eventually moved on to speak with local chefs, trade recipes and put in an appearance on Haitian TV. I respect and thank mayor Clesca for protecting our people's integrity and pride. Don't get me wrong, I know that if your in need you should accept help. Yet, this was not help...just exploitation at its best! What some of our people don't understand when they are being bedazzled with lights and cameras in action, is that they benefit much less from it than they know or realize. Let's just say, the smiles on the other end of those cameras greeting them are short lived and as genuine as leather made from manufacturer created cow skin! They smile while taking the worst shots of us, pretending to show us in a good light.